Now an annual event on the Spadeadam Calendar is the NYE Autotest at Pirelli Carlisle. This year increased in popularity with 29 entries if everyone turned up. All of which had competed on SMC events during the year so popularity is increasing. 12 tests were planned during the day and two tests were set up side by side to get maximum runs done. Hampered slightly by an abandoned car meant out area was squashed slightly making tests tighter than planned. Test one. Peter Wright was joint quickest with 40sec in his nimble mini ideally suited to the layout the same time as Chris Hunter in his MX5. Drew McLean was next on 41sec showing that rear wheel drive MX5’s can compete with mini’s on tight tests. Next was Barry Lindsay in the 106 with 42sec. Quickest Junior was Jamie Barnett using the club car on 49sec. Wrong tests for Mark S, Colin Trotter, Kieron Stynes. Test two was the rerun. Chris was quickest with a 39sec. Peter matched his first time a 40sec then Phil Hodgson on 42sec then Drew and John Holiday on 43sec. Quickest Junior Jamie on 47sec. Wrong test for Mark, John Ross. Test 3 Kenton Pattison was quickest with the Saxo with 42sec. 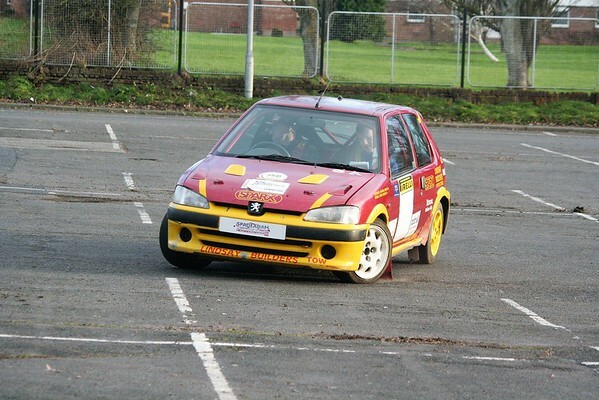 Nigel Harkness in the Corsa on 43sec ahead of Helen Harkness on 47. Peter getting 53sec. Quickest Junior Martyn Petry in the 106 with 1m00. Wrong Tests for Mark, Jamie, Sade Burke in a Mg Rover. Test 4 was the same test but times were very varied. Kenton & Nigel were over 20sec slower This time Peter was quickest with 44sec Chris was next on 53sec then Drew & John H on 55sec then John R in the club car Fiesta on 57sec. Club car is provided to members wishing to try auto-testing before they purchase a car, John uses it to prove that it is a competitive car and offers to navigate and advise newcomers. 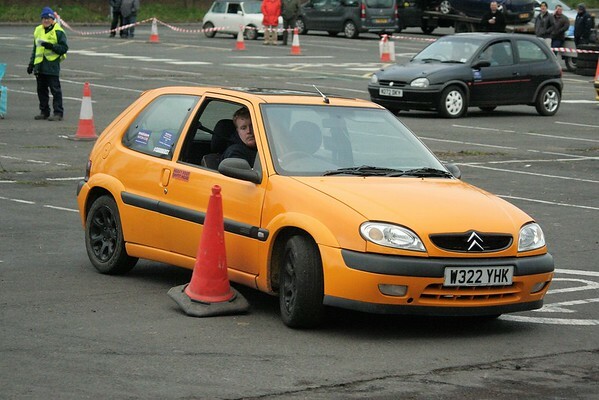 Quickest Junior Sam Trotter in his Micra on 1m02. Wrong test for Phil Jobson who was using the event to give the silver bullet a run ahead of a road rally coming up. Would call it a day rather than wear the new tyres. Lizzy Burke would also retire from the event when the MG stopped. Test 5 was after a short break to walk the new routes over the same layout of cones, and a break for the marshals. Peter got 57sec ahead of Chris on 58sec, John H in the Mg with 1m02 the Phil and Helen on 1m04. Quickest Junior Sade with 1m13sec. Wrong tests for Mark, Colin, Jamie & David Garstang in his Fiesta. Test six was a repeat, Peter getting 54sec, Drew on 59sec, Kenton on 1m00 then John H with 1m01. Quickest Junior was Sam with 1m09. Wrong tests for John R, Sade, Jamie & Mike Burke. Test 7 Peter was on top form with another quick time of 46sec. Chris getting 49sec, Kenton on 50sec followed by Drew on 52sec. Quickest Junior Sam with 1m08. Wrong tests for Phil H, Mike, Jamie & Sade. Test Eight, Peter with 46sec, Chris with 48sec, Kenton on 49sec then John H, Colin & quickest junior Sam all with 51sec. Wrong tests for Phil H, Mike, Jamie, Sade, David & John R.
Test 9 was a bigger test over the whole area but still felt arm numbingly tight! Chris was quickest with 1m39, Peter getting 1m45, John H on 1m 46, Drew and Colin on 1m51. Quickest Junior was Jamie with 2m00. Wrong tests for Mark, Sam and Kieron. Test 10 was a repeat, Chris improved with 1m38, John H got 1m40, Peter on 1m43 the Barry on 1m 51. Quickest Junior Sam with 1m57 and no wrong tests amazingly. Test 11 was the last. 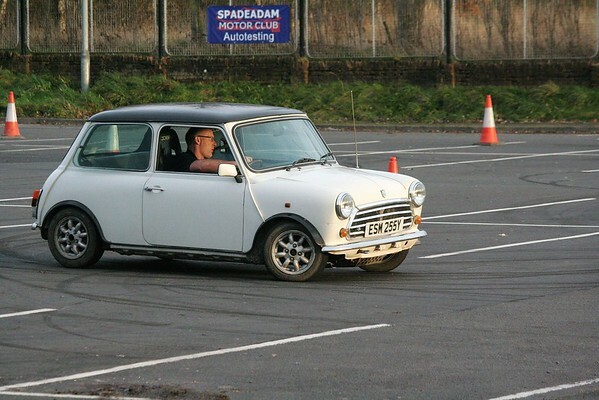 A faster test but the mini was still the quickest with Peter getting 49sec. Chris on 52sec the Barry, Mark in the C2, Phil H, John R & John H all on 53sec. Quickest Junior Martyn with 59. Wrong test for Jamie & Mike. Thanks to Pirelli Tyres, Carlisle for the use of the venue and the marshals / timekeepers – Caroline Lodge, George Carrick, Michael Lindsay, Dylan Jones & Geoffrey Harkness.